A fascinating exploration of the environs of Leck Beck and Ease Gill including the atmospheric Ease Gill Kirk and the magical Cow Dub. The first, and last time that I visited Ease Gill was way back in 2004, towards the end of my wonderful first year of walking in the Yorkshire Dales. On that particular walk my friend and I briefly paused at Ease Gill Kirk on the outward leg of a long walk over Great Coum and Gragareth from Leck. I’ve wanted to go back for a while now with a decent camera and more time to explore the scenery of Ease Gill without the distraction of bagging nearby summits. Joining me on this walk, for our first outing together since Attermire Scar the previous autumn, was my friend Tim who hadn’t been to this particular area before. Starting from the handy car park next to St Peter’s Church, Leck we dropped down to Leck Mill before taking the lower option of two paths heading into the valley of Leck Beck. After passing through some nice woodland the path crossed a couple of beckside fields until we reached access land. Rather than immediately climbing up to join the higher path we first carried on a short distance upstream to crossing a narrow and rather wobbly footbridge to visit a nice little waterfall just after the beck curves round to the north-west. After Tim and I had satisfied ourselves that we’d taken plenty of photos we braved the footbridge again before climbing up to the higher path. Heading north on this past the ruins of Anneside we finally came to the steep rim of Ease Gill. Tim didn’t fancy the look of the steep path down into Ease Gill Kirk so I dropped down for a look around. 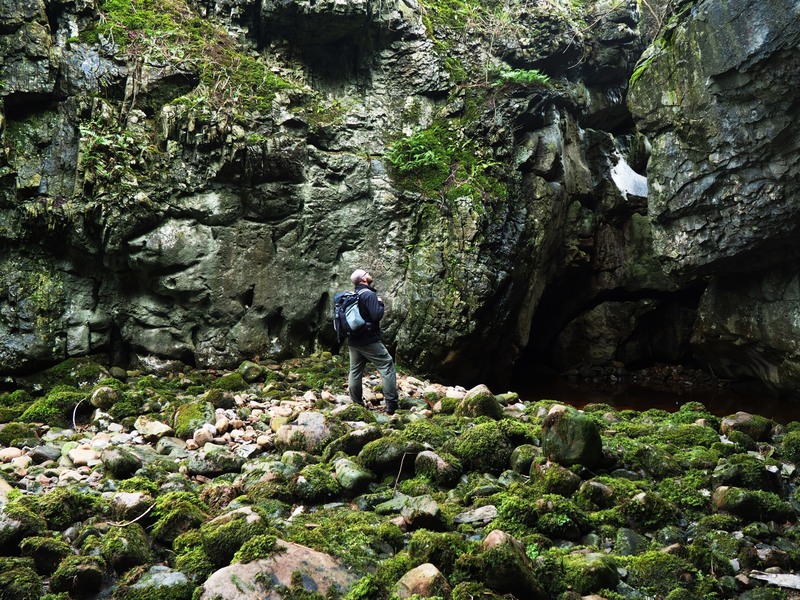 With its high limestone walls, caves and rock pools Ease Gill Kirk is atmospheric a place as any in the Dales. It is also quite slippery as I discovered when I suddenly found myself on my backside, certainly care needs to be taken. After climbing back up to Tim we continued a bit further above the gill before dropping down again where the right of way crosses Ease Gill on its way to Bullpot Farm. Briefly having to climb back out of the gill to bypass a dry waterfall we were soon back in the gill for a fascinating walk alongside the dry streambed. After about a mile we came to Cow Dub. This was my first visit and what a wonderful place it was! I almost hate to post photos or describe it so not to spoil it for anyone else. Cow Dub is basically a narrow slit where Leck Beck drops down, thread like into a dark pool which drains underground. To properly see this magical spot it is necessary to as close as possible in a sitting position. After taking at least 40 photos of the little waterfall we climbed up the bank to the south before crossing a footbridge over the gill and then up the opposite bank to begin a spell across the soggy moorland of Casterton Fell. Despite being damp underfoot there were fine views of the snow covered tops of Crag Hill, Green Hill and Gragareth, as well as the steep flanks of Castle Knott and Calf Top above Barbondale. Eventually we arrived at Bullpot Farm to begin the walk back to Leck. Just past Bullpot Farm was Bullpot of the Witches, a spectacular pothole with a waterfall plunging into its dark depths. Once back at Ease Gill we then retraced our steps along the upper path and ultimately followed this all the way back to Leck. Towards the end Tim, who hadn’t done any walking for some time, was getting tired and managed to get a lift on a quad bike some of the way from a friendly chap out working for the local estate. It was a humorous end to what had been a walk full of interest. Highly recommended. Thank you so much for posting this! I’ve walked up to Ease Gill many times: one of my favourite walks but I’ve never seen Cow Dub: I’m now itching to get back up there! Hi Sandra, thanks for leaving a comment – glad you liked the post. Cow Dub is a must see!